ummm, what? That didn’t happen? That pitter-patter on my roof are not birds dancing in the sun? The sound of gushing water is not my washing machine? (I DID wonder how my clothes made it from the bedroom to the laundry room without me). The wet ground is not because my lovely neighbour watered my yard? Ok. Well, the only way I can see to combat a late spring is to revel in the last few weeks of eating comfort foods. If I’m not warm on the outside I can be warm on the inside. This is one of my faves and because I know much of the country is still experiencing some winter it may become a new favourite of yours as well. It is is based on my chicken pot pie but I got lazy and decided that making the pastry was waaaay too much work so I opted for dumplings. Soft, fluffy pillows of goodness. I think we should eat this every day until the REAL spring arrives and I think we should start now! The stew is on the thinner side (but not watery) which I like with the dumplings. The flavours and method are much like the filling for my chicken pot pie, the perfect thing to let bubble and brew on a chilly afternoon. The dumpling recipe is compliments of Joy the Baker, who uses them in her chicken soup recipe here. Go forth and… ummmm… stay dry (insert rolling eyes here). Season the chicken with salt and pepper. Heat a glug of oil over medium-high heat in the bottom of a Dutch oven or large heavy pot. Brown chicken thighs skin-side down until golden, flip and brown the other side. You will want to do this in two batches because crowding the chicken will steam it rather than fry it. Transfer to a plate and set aside. Pour off most of the fat (reserving it to use later in this recipe) leaving enough to coat the bottom of the pan. 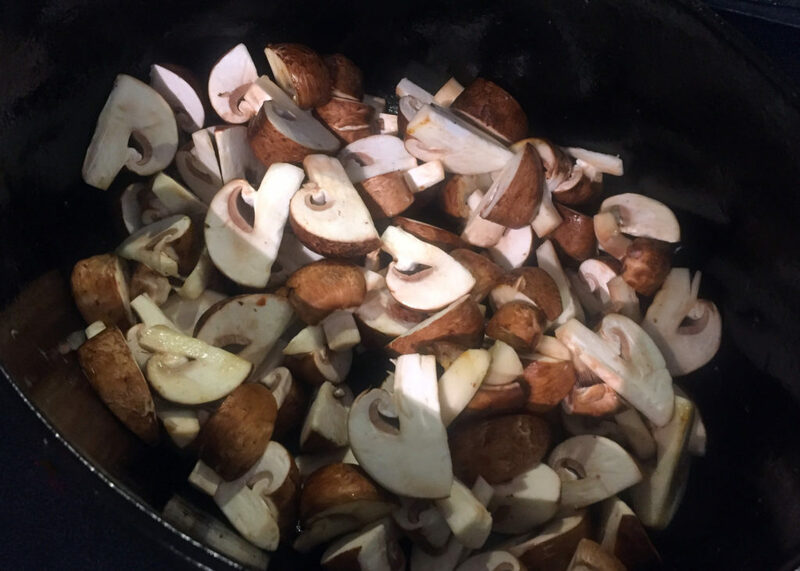 Add the mushrooms and fry until they release their liquid, it evaporates and they start to brown, about 5-6 minutes. Set aside. Use some of the fat you poured off the chicken or heat another glug of oil in the same pot. Add onions, leeks and celery, season with salt and pepper, and saute until softened, about 7 minutes. If using, pour in the sherry and use it to scrape up any bits stuck to the bottom of the pan. Simmer until most of the sherry has cooked off and then add chicken broth, milk, thyme and bay leaf and bring to a simmer. Nestle the browned chicken and any accumulated juices into the pot. 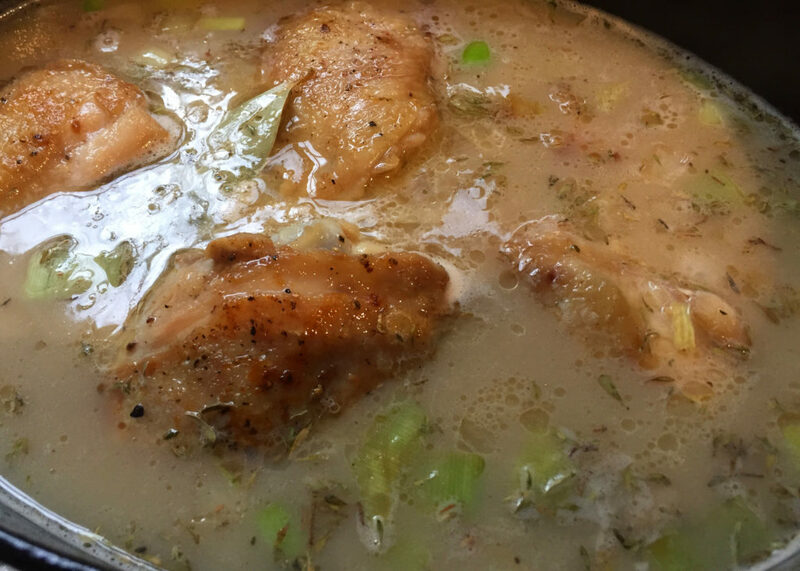 Cover and GENTLY simmer 30 minutes, after which the chicken should be fully cooked and tender. Transfer the chicken to a cutting board to cool slightly. Discard the bay leaves and sprigs from the thyme if you used fresh. Allow the sauce to settle for a few minutes, then skim the fat from the surface using a wide spoon and set aside. In a small bowl, using a fork, mash 3 TBS of the fat from frying the chicken and what you skimmed from the stew (replace any or all of it with butter if you prefer) with the flour into a paste. Ladle some of the warm liquid over it, and stir until smooth. Add a second ladle and stir again. Return this flour mixture to the larger pot, stir to combine. Add the diced carrots, soy sauce, anchovy or miso paste, and hot pepper flakes. Shred or dice the chicken, discarding the bones and skin and return the meat to the pot along with the reserved mushrooms. Bring back to a simmer for a few minutes to thicken. Taste and adjust seasoning. In a medium bowl, whisk together flour, baking powder, salt, thyme, and pepper. Add the butter and use your fingers or a pastry cutter, break it down into the flour mixture creating small flecks of butter throughout. Add the beaten egg and buttermilk and stir until just combined. Do not to over-stir or the dumplings will be tough. Make sure your stew is at a VERY gentle simmer. 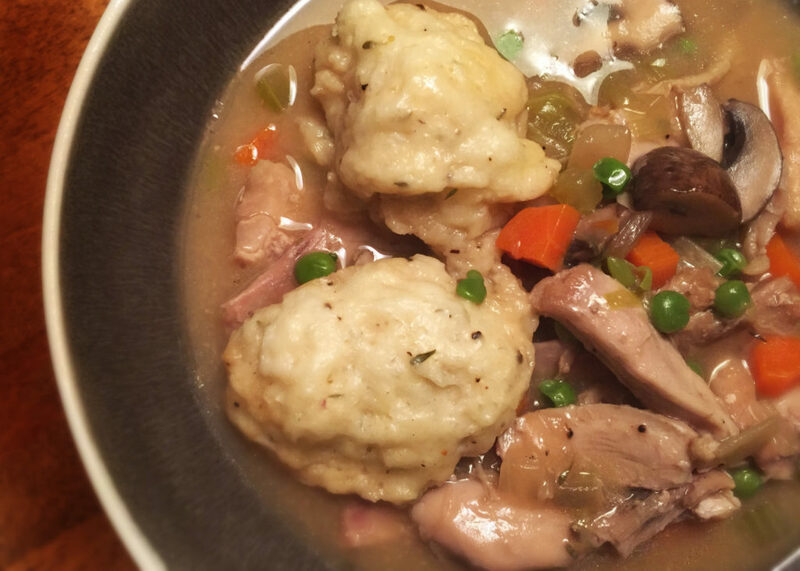 Drop generous tablespoon-sized dollops of dumpling dough on top of the stew, about a half inch apart. Cover the stew and continue to let simmer very gently for 10-12 minutes. 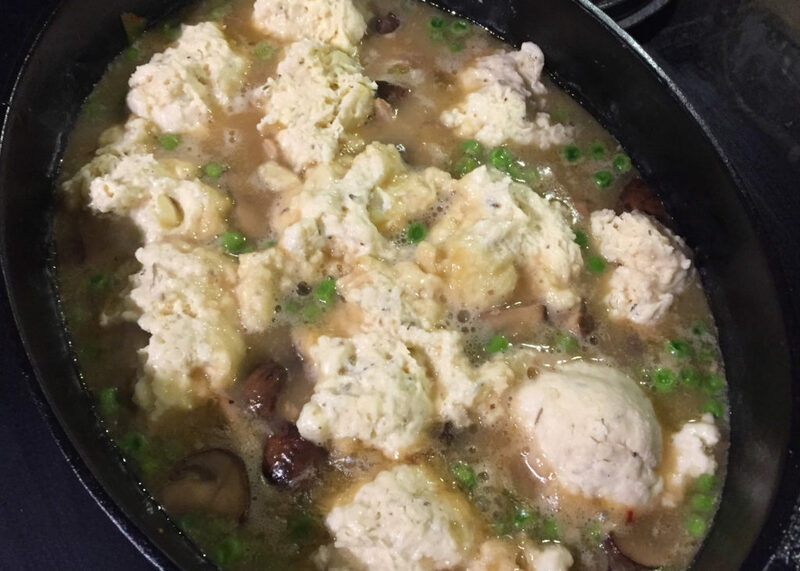 By that time the dumplings should have risen to double their size and be completely cooked through.